Tattoos, because of their relatively permanent nature, have been seen by many as being antithetical to fashion, whose governing imperative is that of constant change. As David Curry (1993, 80) states, tattooing "can never be a true fashion ... because tattoos cannot be put on and left off by the season." 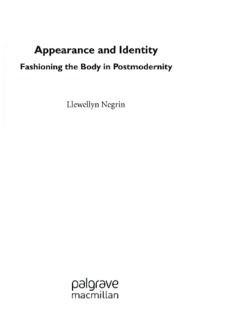 Ted Polhemus concurs, arguing that "any permanent body decoration like a tattoo is as anti-fashion as it is possible to get literally making change difficult if not impossible" (1994, 13). Reinforcing the apparent antithesis of tattoos to fashion is the fact that while they were once employed primarily to indicate one's affiliation with a group, they are now more frequently adopted as individualized statements of personal identity. Thus, rather than relying on standardized "flash" motifs, today's tattoo wearers are more likely to choose customized designs as a way of signaling their "uniqueness" and lack of conformity. As Susan Benson writes, "... central to a lot of contemporary tattoo and piercing talk is the idea of individuation; of the tattoo ... as a 'declaration of me-ness'" (2000, 245). However, despite their apparent incompatibility with fashion, tattoos are increasingly being promoted and used as fashion items, as evidenced by their growing prevalence in advertising and on the catwalk, as well as their adoption by celebrities in the sports and entertainment worlds. Jean-Paul Gaultier, Calvin Klein, Hugo Boss, and Katherine Hamnett, for instance, have all recently utilized tattoos in their advertising campaigns.